The high print speed, colour print capability and versatile paper handling make the Brother DCP 9020CDW a great multifunction printer for small office workgroups. It supports direct printing to increase productivity and reduce operational costs. Brother DCP 9020CDW toner cartridge helps in reducing the overall printing cost and making it an efficient printer. Brother DCP 9020CDW weighs approx. 18.3 kg and measures about 410 x 410 x 483 mm respectively. The 93 mm full colour touch LED panel contains all the major controls including copy, secure print scan and web features. It supports Wi-Fi, USB 2.0 and ethernet connectivity options making it more user efficient. Print speeds are up to 18 ppm for colour and monochrome files with the resolution up to 2,400 x 600 dpi. Supports direct printing from USB sticks, mobile devices, Google Cloud and Apple's AirPrint. Brother DCP 9020CDW offers scan to network option and supports two sided printing feature so that the users can save their resources as per their ease. The printer has an input tray which can store up to 250 sheets of paper with a single sheet multipurpose tray. 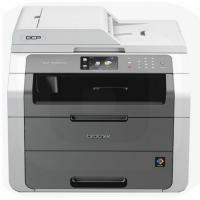 The Brother DCP 9020CDW printer streamline your office by printing, scanning and copying with the same machine. The integrated, easy to navigate touchscreen control panel helps in smooth operation and provides ease of use. With double-sided printing functionality and high-yield colour Brother DCP 9020CDW toner cartridges, helps you in reducing the printing costs. How to change the drum unit of the Brother DCP 9020CDW Printer? Brother DCP 9020CDW printer provides wireless connectivity and is apt for office as well as home users. A pack of Brother DCP 9020CDW toner cartridges are shipped along with the printer. The printer offers good print quality. At times you’d experience blotches or blurry prints. These print quality issues and not usually due to low ink in the tone cartridge. These indicate the replacement of the drum unit. The printer will also indicate that the drum unit needs to be replaced by blinking the Drum LED light. You can purchase the drum unit along with Brother DCP 9020CDW toner cartridges as consumables online. Turn on the printer. The Drum LED light will be blinking. Open the front cover of the printer by pressing the release button on the cover. For about 4 seconds, press and hold the GO button on the control panel of the printer. All the LED lights of the printer will light up. When this happens, release the button. Take the drum unit and toner cartridge assembly out of the printer. Place this drum unit on a piece of cloth or a paper to avoid contact with clothes. You will notice a blue lock lever on the drum unit. This lever holds fast the toner cartridge. Press the lock lever to release the Brother DCP 9020CDW toner cartridge. Handle it with care. Keep it on a piece of paper. If the toner spills on your hands or clothes immediately wipe it off with cold water or wash it off. The use of warm water will fix it to the clothes and make it permanent. Take the new drum unit out of the packaging and put the toner cartridge correctly inside it. Now place this drum unit back into the slot in the printer. Close the front cover of your printer. The Drum LED light will turn off. The printer is ready to use. Q. Are your compatible Brother DCP 9020CDW toner cartridges refillable? Do you provide the service of refilling cartridges? A. Yes, you can choose to refill our compatible Brother DCP 9020CDW toner cartridges once they are empty. However, a refilled cartridge may produce inferior print quality and reliability. We do not provide refilling facility of compatible cartridges. Q. Are there any special offers applicable on the purchase of the Brother DCP 9020CDW toner cartridges? A. Yes, if you are a first time user of our website, you can apply the coupon code D10 at checkout to get a 10% discount on our already affordable price for DCP 9020CDW toner cartridges. Also for all our Brother cartridges, you can apply the coupon code DIS5 at checkout to get a 5% discount. You can apply just one coupon code at a time. Q. Will there be any additional charges if I order Brother DCP 9020CDW toner cartridges from this site? A. All our orders include some delivery charges that start at €1.99 inc. VAT. The delivery charge of the cartridges may vary according to their weight. Q. How much noise does the Brother DCP 9020CDW printer generate? A. Brother DCP 9020CDW generates 53 dBA noise during operation and 33 dBA on ready mode. Q. What is the optical scanning resolution supported by the Brother DCP 9020CDW printer? A. Brother DCP 9020CDW has an optical scanning resolution of 1200 x 2400 dpi from Flatbed, 1,200 x 600 dpi from ADF. Q. What interfaces are supported by the Brother DCP 9020CDW printer? A. The interfaces supported by this printer are Wi-Fi, Hi-Speed USB 2.0 and Ethernet (LAN). Q. What operating systems does the Brother DCP 9020CDW printer support? In Windows OS, it supports Windows Server 2003 and greater. In Mac OS, it supports Mac OS X (10.6) and greater. On smartphones, it supports Android, iOS and Windows. It also supports Linux OS computers. Q. What should i do if i am not able to print from my computer via network for my windows? A. To achieve the optimum results with the everyday printing of documents, you need to configure the network settings first. If you are not able to print via network, follow the steps below to resolve this issue. Verify that the Brother machine is powered on and there are no errors. Check the LCD screen for the error messages like paper jam or the empty Brother DCP 9020CDW toner cartridges. Perform the suitable action to resolve such issue. Q. What ink capacity does the compatible Brother DCP 9020CDW toner cartridges offered? A. We offer high-quality compatible range of toner cartridges in much affordable prices. Each cartridge is listed with a unique code number by a manufacturer and contains 4 pack of high capacity premium quality Brother TN241 & TN245 toners, with TN241 black, TN245 cyan, TN245 magenta, TN245 yellow. It has the capacity of printing 2500 pages for black and 2200 pages each for colour cartridges. Q. I have just installed my new compatible toner cartridges for my brother’s machine and facing the problem of blank printouts what should i do? A. In case you receive a blank printout check the settings on your computer and make sure that everything is fully linked up. Also make sure that the sealing tape has been removed from the new Brother DCP 9020CDW toner cartridges. Remove the seal from the cartridges in case it is there and try printing again. If you still face the same problem try reinserting the toner cartridges. This might resolve the issue. If the problem still persists call the customer support executive for help. Q. Can you tell me steps to clean my Brother DCP 9020CDW printer? A. You should clean your Brother DCP 9020CDW printer several times a year to keep its working at its best. If the printer is not in use, close the output tray and front cover to protect the it from dust. To start cleaning process, turn off the printer first, unplug all the cables, remove all the papers. Clean the scanner with a soft cloth moistened with a little glass cleaner (do not press the scanner glass forcefully), the control panel and the outer case can be cleaned with a soft, dry lint-free cloth. Also while replacing the Brother DCP 9020CDW toner cartridges you should clean the inside of the machine. Don’t let liquid solution (water, oil, lubricant, etc.) get inside it. Q. My Brother DCP 9020CDW printer is showing a message “Calibration Failed”. What should I do? This should resolve the issue. If the problem continues, you should directly contact the Brother customer service. Q. Can I use these Brother DCP 9020CDW toner cartridge (TN241) with my Brother HL3150CDW printer model? Q. Are the Brother drum units listed on this page original? Q. Do you have non-Brother drum units available? If not where shall I get them? A. Unfortunately, currently we only have stock for the original Brother drum units. We would not be able to advise you on from where you should get these non-branded Brother drum units. Q. Are you sure these compatible Brother DCP 9020CDW toner cartridges work fine with my Brother DCP 9020CDW printer? What if they do not? Would you be able to replace them? Q. I have a Brother DCP 9020CDW printer and my black cartridge has run out. Do I have to replace all the toner cartridges or only the black one? A. Thanks for the question. The Brother DCP 9020CDW printer comes with beneficiary advantages. If your black Brother DCP 9020CDW toner cartridge has run out or expired, you only need to replace with the black toner cartridge and the printer will re-start printing. There is no need to replace all the toner cartridges if anyone of them has run out / expired. Make sure the cartridges are inserted into their specific slot.